Rated 5 out of 5 by Bumbles2 from Just Brilliant...an awesome series !!! What more can I say about this Weather Lord series!!! This release is about a Queen in training (Jenny) and the adventure and tasks she must complete with Professor Theodor as her mentor and overseer!!! She is following the trail a nasty rat Pirate who is trying to defeat Jenny and her troops. Don't want to say too much more or I'll spoil it for you!!! The artistry in this game is phenomenal...you won't have any problem seeing your goals and the music and background noise doesn't overwhelm you while you're playing. I loved the storyline and it was definitely easy to follow. There were some challenges, not many mind you...all you have to do is put your thinking cap on because they are all doable. I had a load of fun with this release and hopefully you will too !!! Rated 5 out of 5 by cleep100 from Weather Lord Keeps Getting Better! I really like where they've taken this series. The last couple of editions have been excellent! They are now my go-to favorites. Only one slight criticism - I wish the later levels were a little more difficult to achieve. With this collector's edition, you do get 15 extra levels that are more challenging, which I enjoyed. Keep up the great work! Rated 5 out of 5 by CheyenneStar from Loved this game I played the hour preview & was really enjoying the game. Actually sad when it ended. The game play was fun but also challenging. I loved the fact that you could play in timed mode or relaxed. Lots of things to do like building houses, collecting your materials. Kept me well entertained. Now I want to play the others that lead up to this one. I hope this helped you to at least try this game. Enjoy!! Rated 5 out of 5 by McKoehn from Happy, happy, happy with this TM game! The graphics are fantastic: especially love the birds flying overhead. Detail is very nice, will enjoy going back and replaying so that I can look over the full screen more closely. First time around play the easy setting, then go back to play the more challenging setting. Get hours of play, and still have fun the entire time. The attention to detail in this game will make the second time around just as much fun. Thanks to the developers on this one! Rated 5 out of 5 by Ziggy_Zigster from Great addition with some new aspects! I have all but two of the previous WL games- the 2nd and 3rd. I found those games enormously frustrating. Coincidentally, the majority of reviewers of this game thus far who complain this game is 'too easy' like the 2nd & 3rd best. I love TM games and I do want a challenge, but I don't want it to be endlessly frustrating. IDEALLY, a TM game would have an 'expert mode', 'normal mode' and a 'relaxed mode' that way it satisfies EVERYONE. But not all developers do that. I played this game for the full trial and will be purchasing it. I find it challenging enough for me. I don't think it's too easy or too hard, but just about right. There are several aspects of this game I want to point out that struck me by surprise. There are some slight alterations in the types of weather used and more noticeably you have pirates instead of goblins. I like the change. I found these new additions to the game made it much more enjoyable than the same old goblins. Bottom line is not all TM games are for every TM fan out there. Everyone has a different take on them and a different point of view. My best advice is that you try the game and if you like it, as I do- its a buy. Rated 5 out of 5 by brimaz from LOVE IT! Like all the other Weather Lord games, this one is great fun. I played the whole hour of the trial and thoroughly enjoyed it. It's great to get a decent time management game instead of the same-o same-o dark and gloomy HO's that are the main offering from Big Fish these days. It's cute to see Jenny stand by while everyone else does all the work, then she steps in and brandishes her sword to get rid of the pirate chiefs. I won't be buying the collectors edition, but will wait for the standard version. It doesn't make sense to me to pay double just to get an extra chapter. Rated 5 out of 5 by filosota from Fun time management game Great time Management game. 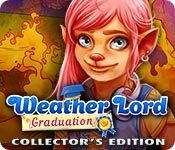 All the others Weather Lord Games, are also great! I love all of them! Rated 5 out of 5 by PepsiAngelLady from Jenny Learns how to manage her Weather Lord so she can do battle with Her Dragon who only wants her Golden Egg back the pirates stole..I Love it!!!! This is a Great Time Management Game that follows the other Weather Lord processes and you get to know Jenny and her willpower to listen to her Mentor and work to make her Kingdom and parents proud. 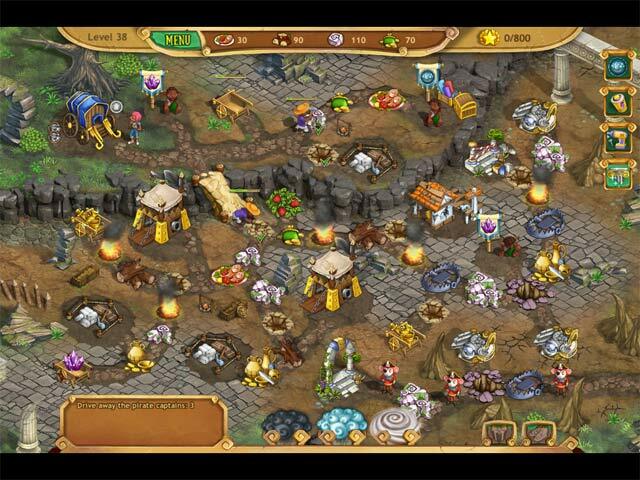 If you like or love Time Management games then you will love this one. Good Luck and Enjoy!!! Rated 5 out of 5 by pennmom36 from Passing Down The Royal Torch My how time flies, King Victor and Queen Victoria are ready to pass the Royal Torch down to their daughter, Princess Jenny, after she graduates of course! Jenny is eager to begin her Young Queen courses at the University, where Professor Theodor will teach her all she needs to know to be rule her people. Princess Jenny barely gets a chance to settle down when catastrophe strikes, Pirates have invaded the University and have stolen a very important artifact. 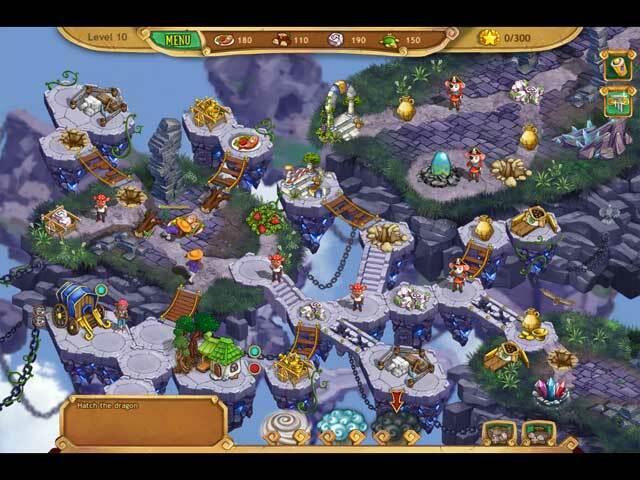 Princess Jenny's skill's will be put to the test, as she sets out to retrieve the Great Dragon's Golden Egg, before the magnificent beast awakens and wreaks havoc upon the kingdom and it's people! I have always loved the Weather Lord Time Management series, where you use the elements of the weather to progress. Rain is used to grow crops and even put out the flames of burning buildings. 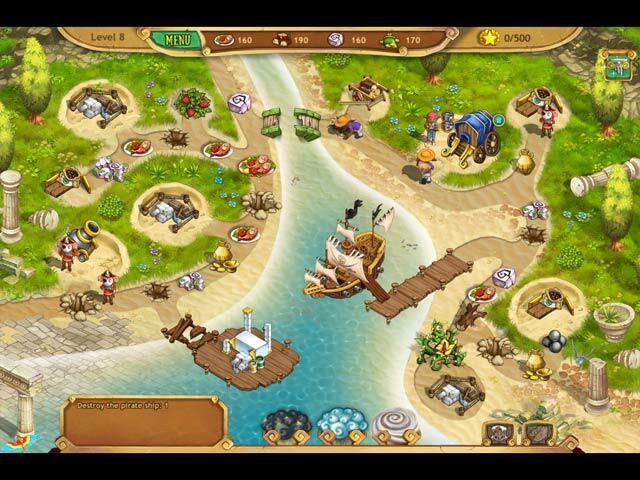 The Sun dries up puddles, Wind can be used to power mills for resources, and Storms can be used to chase away the pirates. You can play in a Relaxed, untimed mode or Normal mode, and you can earn Gold, Silver or Bronze medals for each level completed. Throughout the adventure, you will build flowerbeds, columns and even new houses that will increase your Skill level (9 skills total) This will help you use the weather more effectively, and gather more resources which improves your reputation. There are the usual TM tasks of clearing paths, repairing bridges, gathering food, wood, stone and gold and building Saw mills, Grain mills, and Stone mines. Bonuses are added which speed up workers, produce resources faster, recharge the weather quicker or increase production, but this effect is only temporary and must recharge before using it again. Merchants sell different goods and tools, and some items can be crafted when combined, you can even gather the essence of rain to create a downpour in this edition. In this CE version, there are 31 hidden Jigsaw puzzle pieces available, but they won't be available in every level apparently because there are 60 regular levels plus the bonus levels, which is kind of a bummer in my opinion, and it would be more of a challenge if they morphed because they are quite large and easily spotted. In this Collector's Edition, there are 28 Awards to earn, 10 Bonus Levels and 10 Collector's Edition level available, 9 Skills to learn, replayable Movies, 8 Music Soundtracks, 6 Wallpapers, 31 hidden Jigsaw Puzzle Pieces and a built in Strategy Guide. For my personal tastes, these extra's just aren't worth the CE price, so I will wait until the Standard Edition version is released, enjoy! Rated 4 out of 5 by TooOld2Play from Not like the others...but a nice game! For those who are fans of the Weather Lord series, this installment is not as challenging as the others but still enjoyable. The fairies in Graduation are NOT friendly. Instead of giving you gold, they stop our little workers from their appointed tasks. There are pirates and cannons but the balloon-blowing trolls are back along with the floating ghosts. The gold mines are gone and replaced with stone mines but wheelbarrows filled with needed supplies abound. The fairy houses are still there and a lot of new buildings that need upgrading as well as a storehouse that provides goodies. I actually enjoyed it despite the lack of real challenge. Sometimes you need a break from all the running around, collecting and building. The developers could do without the puzzle pieces though, they are so obvious that they add little to the game play. All in all, worth a go during a BOGO sale and for those who want all the games in a series.